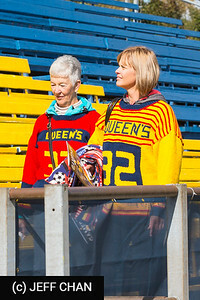 Photos from the Queen's Golden Gaels vs. Toronto Varsity Blues at Richardson Stadium, Kingston, ON, on October 11, 2014. All photos are by Jeff Chan. Jeff is past Chairman of the Vanier Cup - Canada's University Football Championship and the Premier University Event in Canada, and was a member of the Canadian College Bowl Board and Vanier Cup Organizing Committee from 1978-2001. 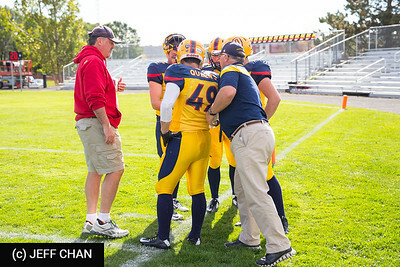 All photos are Copyright (c) Jeff Chan 2000-2014, and may be used for personal non-commercial applications including by Queen's University, so long as photo credits are shown or the photos are otherwise attributed to Jeff Chan. All other rights, including for all corporate use, are reserved. Never mind that the opponent was a team that Queen’s habitually beats. Never mind the circumstance, that the game had no playoff implications for either side. 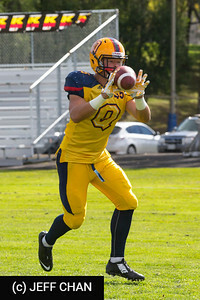 “It feels good to finally win,” Queen’s Golden Gaels linebacker Mike Moore said Saturday, after the Gaels defeated the Toronto Blues 48-27 in an Ontario University Athletics football game at Richardson Stadium. 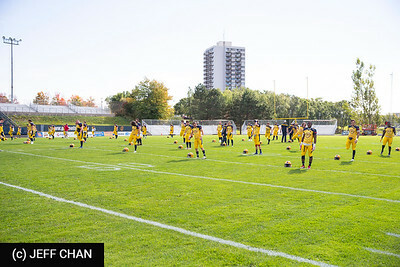 It will be the first official victory of the season for Queen’s, which was 0-5 going into the game after a season-opening win at Windsor was forfeited. “We’ve worked hard; we’ve battled,” Moore said. “You can’t say we haven’t been playing well. We just haven’t been playing full games. After four or five losses, it’s hard on a team. It looked like Toronto was prepared to do its bit to facilitate that when it fumbled three times in the first seven minutes of the game. The Gaels turned the last two into a touchdown and a field goal, but before the first quarter was complete, the Blues had tied the game 10-10. Queen’s led 17-10 at halftime and they were about to get the ball for the first time in the third quarter when Nick Dowd blocked the punt of his former teammate, Aaron Gazendam near the Toronto 30-yard line. 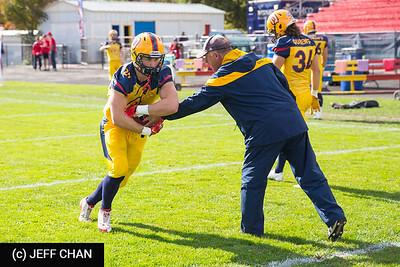 Derek Wiggan, the Gaels veteran defensive lineman, picked it up and appeared headed for a touchdown when he was finally brought down at the Toronto three-yard line. 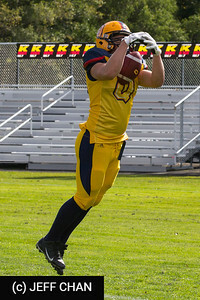 Two plays later fullback Justin Gleben carried into the Varsity end zone for a touchdown that gave the Gaels a 14-point lead. 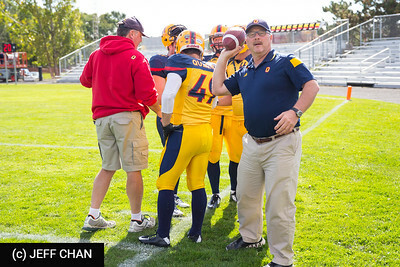 Though Toronto would narrow that lead to six points before long, Queen’s coach Pat Sheahan said the blocked punt was the big play of the ball game. If having a punt blocked didn’t discourage the Blues, certainly the Gaels’ next touchdown did. It happened with nine seconds left in the third quarter and gave Queen’s a 34-20 lead. 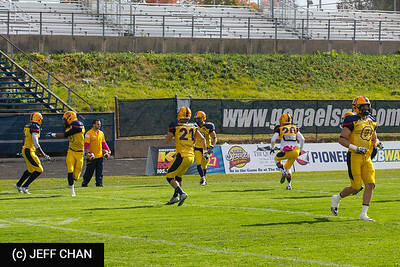 A 27-yard punt return by Doug Corby set the Gaels up at the Toronto 49-yard line. Following a penalty, a nice run by Jesse Andrews got Queen’s to the Varsity 29 but the Gaels faced third down and inches to go. 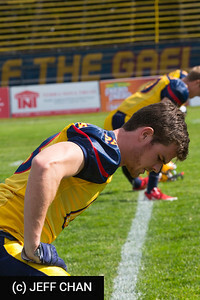 Quarterback Billy McPhee found Alex Carroll at the Toronto three-yard line but as he fought to reach the end zone, Carroll fumbled the football. In one of the all-time classic episodes of good fortune, fellow receiver Curtis Carmichael happened to be the first player to spot the loose ball. He picked it up, turned around and took two steps to the end zone for the score. From that point, the Gaels were playing with the kind of confidence that hadn’t been seen since the Windsor game. “It was like the clutch was stuck a little bit but once we got a breakthrough in the second half … it was good. Kudos to Toronto. This team plays us tough. They played us tough the last time they were here and they played us even tougher the last time we were down there. There were a number of highlights for the Gaels, among them career-best receiving days by Carroll (149 yards) and Corby (146 yards) and a lifetime 406-yard passing day by McPhee. “College football is all about working hard,” Sheahan said. “The payoff for the kids is the way you feel after you win. “We’ve competed, we’ve been close, we’ve had some heartbreak. It’s good to see the kids win one and come off the field feeling good about themselves and feeling good about the future. 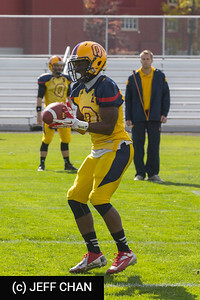 In addition to the fumble recovery score, Carmichael scored Queen’s first touchdown when he and McPhee connected on a 42-yard pass on the very first play after Toronto’s second fumble. Carroll, on a 23-yard pass from McPhee, Justin Gleben, on a three-yard run, Jesse Andrews, on a six-yard run, and Corby, on a 65-yard pass from backup quarterback Nate Hobbs with 76 seconds left in the game, scored the other Queen’s touchdowns. Dillon Wamsley kicked field goals of 18 and 37 yards. 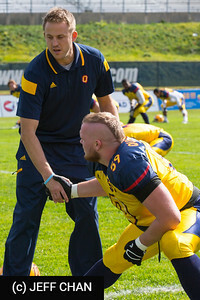 Boris Isakov, who never scored a touchdown at Richardson Stadium in his four years at Queen’s, scored Toronto’s first two majors, both on passes from quarterback Simon Nassar, one for seven yards late in the first quarter and another for 18 yards, where he made a fine play to fight off a defender at the back of the end zone, midway through the third. Nassar passed to Llevi Noel for a 51-yard touchdown late in the fourth quarter, briefly bringing the Blues to within 41-27 with less than two minutes to play. 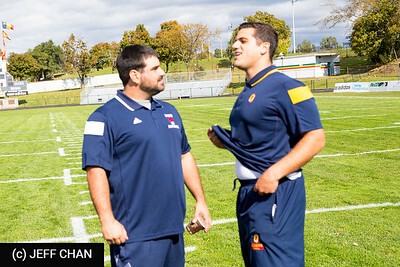 The Gaels resume their schedule Saturday, when they will host the winless York Lions in the annual Homecoming game. Notebook—The touchdown pass by freshman quarterback Nate Hobbs was his first of his intercollegiate career. … Fifth-year man Derek Wiggan appeared to be on his way to his first university touchdown when an inadvertent whistle killed a play at McMaster two weeks ago. Yesterday, he got stopped at the three-yard line. “I’m getting closer,” he said. … The win extended Queen’s mastery over the Varsity Blues. That’s 12 wins in a row since the Gaels rejoined the conference in 2001. Toronto hasn’t beaten Queen’s in a league or playoff contest since Oct. 4, 1975. … After years in the wilderness, the Blues appeared to be on track to rejoin the ranks of the contenders after a 4-4 season last year. Yesterday’s loss, however, leaves Toronto with a 1-6 record. 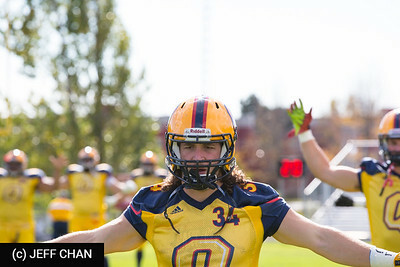 … Last year, when he was playing for Queen’s, Aaron Gazendam, the Holy Cross grad, made a spectacular play on a kick for the game-winning touchdown in overtime against Laurier. He was the holder on a field-goal attempt that was blocked. The ball bounced into his arms, and he tried to punt it through the end zone but didn’t manage to do so. Alertly, he dashed into the end zone and fell on the loose ball. Perhaps his former teammates remembered his heroics that day after blocking his kick Saturday. “They apologized,” he said. … A meagre crowd of 1,018 attended. They didn’t bother to open the student side of bleachers and neither the band nor cheerleaders were there. 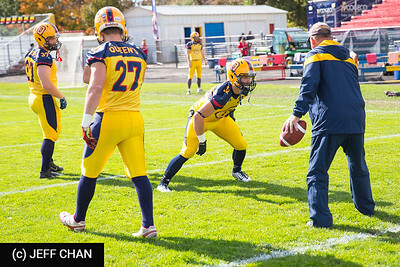 It made Richardson feel like any number of other bleak football venues in the OUA. … Oh, and that canned Oil Thigh played after touchdowns in the absence of the real thing? Puh-lease. Queen’s faithful will do it spontaneously; playing a recording only serves to highlight the fact you don’t have the real thing. 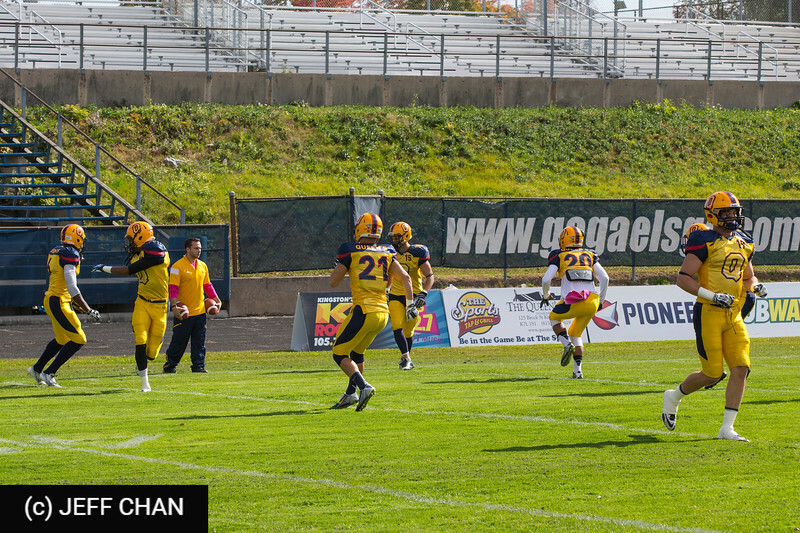 The Gaels grabbed their first win of the season on Saturday, topping Toronto 48-27 at Richardson Stadium. Queen's got the job done through the air in their Thanksgiving matchup with the Varsity Blues, as starting quarterback Billy McPhee (Burlington, Ont.) finished with 406 passing yards, going 22-35 for three touchdowns and two interceptions. McPhee now moves into second all-time on the Gaels yards passing list as he now has 7,775 in his career to move ahead of Tom Denison. He now trails only Danny Brannagan who had 10,714 during his tenure with the Gaels. Queen's took advantage of three first quarter fumbles by Toronto, as Curtis Carmichael (Scarborough, Ont.) caught a 68 yard bomb from McPhee on a corner route to get the Gaels on the board first. Dillon Wamsley's (London, Ont.) 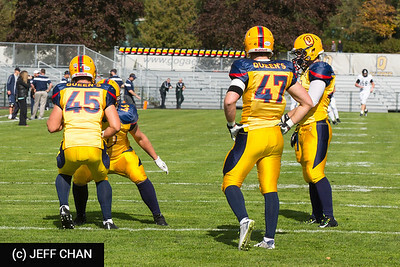 first quarter field goal was also set up by a Toronto fumble, giving Queen's a 10-0 lead early in the first quarter. Frederic Kinkead (Quebec City), Munashe Masawi (Peterborough, Ont. ), and Mitchell Spataro (Barrie, Ont.) picked up the fumble recoveries for the Gaels. 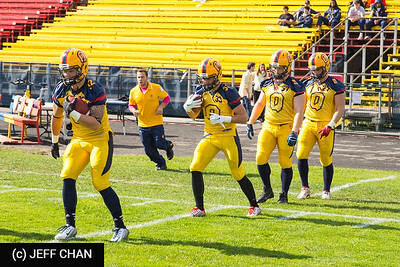 Toronto pulled themselves back into the game on a six yard touchdown toss from Simon Nassar to Boris Isakov and an Eric Hewitson field goal, leveling the score 10-10 after the first quarter. After Alex Carroll (Victoria, B.C.) put Queen's back on top 17-10 in the second quarter, Michael Moore (Mississauga, Ont.) blocked a punt from former Gael Aaron Gazendam to begin the second half. 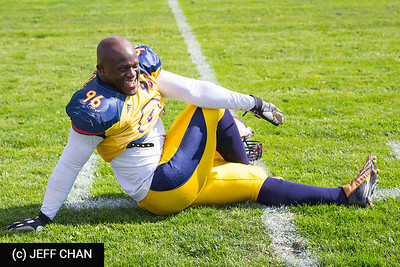 Derek Wiggan (Toronto) recovered the punt for Queens, tumbling 75 yards to the three yard line. From there, Justin Gleben (Barrie, Ont.) punched in another Gaels touchdown to make it 24-10. "The blocked punt set the bar, I think that changed the momentum of the game," head coach Pat Sheahan said. "After that we went right down and scored to give us a 14 point buffer. It wasn't over at that point, but I thought that it gave our team a tremendous boost." 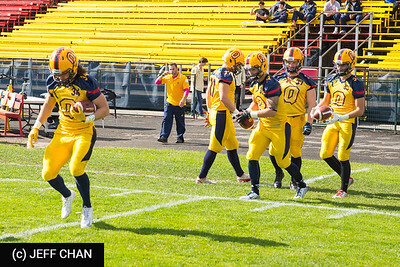 In an action packed third quarter, Isakov caught his second touchdown pass for Toronto, and Carmichael responded for Queen's with his second touchdown of the game, which came off a Carroll fumble after a reception. After Jesse Andrews (Arnprior, Ont.) put the game out of reach early in the fourth quarter, making it 41-20 for the Gaels, rookie Nate Hobbs (Mississauga, Ont.) 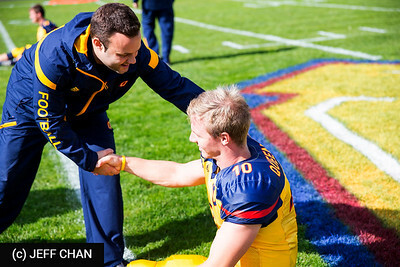 took over the quarterback duties for Queen's. Hobbs connected with Doug Corby (Burlington, Ont.) on a 60 yard catch and run for the first touchdown in his young Gaels career. Lukas Gavac ran for 134 yards, as the Varsity Blues leading rusher, including 96 yards in the first half. Toronto quarterback Simon Nassar, who is coming off a record setting game last week against Carleton, was 29-52 for 341 yards, three touchdowns, and an interception. Nassar's favourite target on Saturday was Llevi Noel, who caught 11 passses for 129 yards. 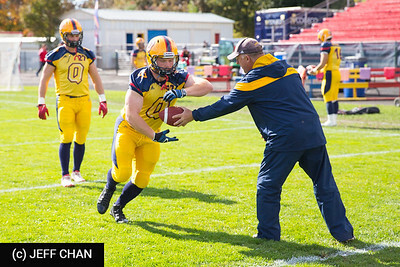 Rookie linebacker Moore continued his standout season for Queen's, finishing with the punt block, a one handed interception, two forced fumbles, and 4.5 total tackles. 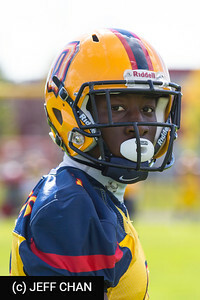 Yann Dika-Balotoken (Toronto) had nine solo tackles and broke up a pass in the Gaels win. Carroll led Queen's with 149 yards receiving, while Corby picked up 146 to go with 62 punt return yards and Carmichael finished with over 112 yards from passes and 36 from kick returns.